Harris-Decima just published a new poll, which has low numbers for both the Conservatives and the Liberals (31 and 26), and relatively high ones for the NDP and Greens (18 and 12). In Québec, the Bloc is trouncing everyone else with 41% against less than 20% for any single other party. 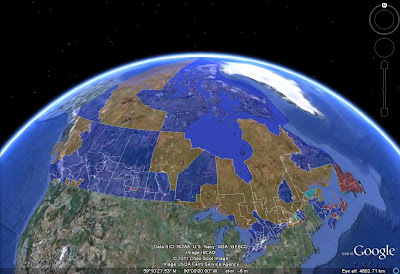 In Atlantic Canada and Ontario, the Grits and Tories are tied. BC is a tight race between the Conservatives and the NDP, while the Tory lead over the Dippers in MB/SK is a slim 5%. The average Tory national lead decreases slightly to 6.1%. A policy that raises the cost of doing business for a wide range of industries, particularly in rural areas, is going into effect. "But the Tories are against the carbon tax," you say. Think again. It's the scrapping of the census long form. All kinds of businesses will find it a lot harder to obtain accurate data about their markets. They will either have to incur additional costs to obtain good data, or use worse data and incur the resulting losses. This is particularly true in rural areas, where voluntary data will be especially unreliable due to small sample sizes. And when the cost of doing business rises, we all know who's paying in the end. But it's much worse than a carbon tax: this policy will actually cost the government money (both directly and indirectly through future poorly targeted policies due to lack of data), and doesn't do anything for the environment (with more forms sent out, it's actually a negative). Plus, you know, Canadians will still have to answer a bunch of questions on the short form, and a whole bunch more on their tax returns. Is it really more personal to tell the government how many rooms are in your house than to tell it how many people live in it, their relation to each other, and exactly how much income of each kind you made? So I fail to see what big privacy gains all this nonsense will get us. Actually, let me take all this back. Although Harper's imposing a "tax on everything," these actions are actually consistent with the general Conservative strategy: assume Canadians are shortsighted ("Let's cut the GST cuz, you know, it's annoying, even though income taxes harm the economy more") and lazy ("A new carbon tax? Noooooooooooo... I don't want to deal with anything new, even if I'll get tax cuts that compensate for the cost"), and propose policies in consequence. It's worked pretty well so far, so let's congratulate the Tories on their good work, eh? The newest EKOS release is out. 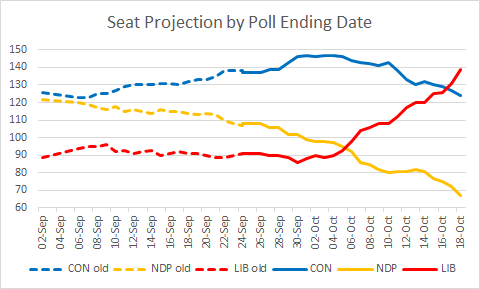 The two-week roll-up really doesn't carry any surprising numbers, except for the Tories being a bit low in BC. The Conservative average national lead falls to 6.3%, mostly on the depreciation of the second week of the previous EKOS poll that showed the Tories with a 10.5% lead. Basically, last summer, the Grits were relatively strong, and everyone else was relatively weak. In the fall, it was the Tories' turn to be strong at the expense of everyone else, and lately, the Bloc and the NDP have been in vogue. But we've been basically dancing around an "equilibrium" level of about 135C, 85L, 50B, 38N. After two weeks without a poll, we've now had four in the past week! The most recent release is by Environics. Not only are the headline figures better for the Grits than in other recent polls, the regional breakdown is pretty good as well in seat-relevant matchups: 10-point lead in Atlantic Canada, small lead in Ontario, and "just" 11 points behind the Bloc in Québec. At the same time, this poll is by no means a disaster for the Tories, who maintain their dominance in the West and remain competitive in the East. The three most recent polls were in the field almost simultaneously (Ipsos 7/6-8, Angus 7/6-8, Environics 7/5-8), and show somewhat different leads for the Tories: 6, 9 and 3 respectively. All three have decent Liberal leads in the Atlantic and (of course) complete Tory dominance in Alberta. In Québec, Ipsos is the odd one out with a much higher number for the Bloc (45% vs. 37% and 39%). In Ontario, Angus stands out (7-point Tory lead vs. virtual ties), while in MB/SK, the Environics poll is the weird one (15-point Tory lead vs. 30+). Finally, in BC, Angus Reid shows the NDP virtually tied with the Tories with the Grits 15-20 behind, while the two other pollsters have the NDP virtually tied with the Liberals, both a dozen points behind the Tories. The average Conservative national lead drops to 6.7%, for now. Just after I mentioned how Angus Reid seemed to have skipped their late June poll, they come out with an early July one! Compared to both the late May Angus Reid poll and recent polls by other firms, this survey has even greater Tory strength across the Prairies, a strong NDP result in BC (just 2 behind the Conservatives), and a strong Liberal number in the Atlantic. Ontario also comes in favourably for the Conservatives (7 ahead of the Grits), while the Bloc lead in Québec is smaller than in other recent polls. The average Conservative national lead ticks up to 7.5%. That's what the Premier of La Belle Province declared to the CBC. Can he win again? Although things look bleak for the Québec Liberals at this point, they had been similarly unpopular during their first term, only to escape with a minority government in 2007. That's due both to the Liberals recovering from their lows late in the term, and to the ADQ push, which prevented the PQ from getting the bulk of the dissatisfied vote, as they would normally have. The former can certainly happen again - we're still more than 2 years away from the next ballot - but the latter, a strong push by a third party, appears unlikely at this point. The question, then, is: without a third party to spoil things for the PQ, can the Liberals recover enough to win a fourth time in a row? Of course, anything is possible in politics in a two-year span, but I think there is real Charest fatigue in Québec at this point. Unless the economy continues to rebound strongly in the next two years, I doubt Charest can pull it off again. And since I think the recovery will slow quite soon (though Canada will likely avoid a double dip - I don't know if the US will), I expect Québec to have its first female premier in 2013. - BC, where Ipsos has numbers broadly in line with the latest EKOS and my poll average, while the previous Ipsos poll showed a whopping Conservative lead. Nice round numbers, aren't they? Well, here are some more for you: my national poll averages are: CON 35.0, LIB 28.0, NDP 16.5, BQ 10.5, Other 10.0; the Tory advantage is therefore 7.0%. Note: Despite the slower summer depreciation for polls, only the 3 most recent EKOS releases, this Ipsos Reid survey and the latest (somewhat dated) Harris-Decima poll are included. This is partially because Angus Reid, which usually has a poll at the end of every month, went AWOL at the end of June. Also, Nanos and Harris-Decima, who publish their results irregularly, don't have recent polls. The relative paucity of data means that projections may temporarily exhibit increased volatility. Why are the Liberals still 59 seats behind the Tories (compared to 66 in 2008) even though their vote gap with the Tories has shrunk by over 4%, which is more than a third of the 2008 gap? Looking at regional data, the Liberals have improved more than 10% relative to the Tories across the West. That big improvement only nets them 2 seats because they were so uncompetitive in the region to begin with. On the other hand, the Grits only shrunk their gap with the Tories by 1% in Ontario, and actually slipped behind the Tories in Atlantic Canada. Furthermore, in Québec, while the Liberals did improve over the Conservatives by 5% (the Liberals lost support, but the Tories lost a lot more), the relevant matchup there is with the Bloc, against whom the Liberals also slid. So that 10+% out West and 5+% in Québec form the 4% national Liberal improvement relative to the Conservatives (which is actually mostly a Tory drop). But Ignatieff has made no net inroads in the most seat-relevant battles: vs. Tories in Atlantic Canada and Ontario, and vs. the Bloc in Québec. That's why I have the Liberals almost as far back in the seat count as they were in 2008. 2) they didn't spread the proceeds from the proposed carbon tax so thin that people couldn't see the benefit. Due to the effect mentioned in the update to the previous post, the numbers that I backed out for the first week of the most recent EKOS poll are not reliable. Thus, it is not appropriate to treat the two weeks as separate polls. However, given that we do have separate information about the most recent week, which I would like to weigh a bit more, I will also not treat the two weeks as one poll. Rather, this is what I'm doing: I am giving a weight to the two-week numbers, and an additional weight to the most recent one-week numbers. The 34-day depreciation period is calculated from the midpoint of the most recent week: although the sample size is small by EKOS standards, it is actually slightly larger than most full polls by Nanos, Ipsos and Angus. However, the average national Tory lead is 7.3% (instead of 7.4%). So this effect can indeed cause certain two-week numbers to be below or above both of the corresponding one-week numbers, but is only significant if sample sizes from week to week are substantially disproportional across demographic categories. I had not thought through this yesterday because I assumed their samples from one week to the next would be roughly proportional, but that's clearly not the case as explained above! This week's (actually these past two weeks') EKOS poll is out. EKOS published figures for the full two weeks on its website, while the CBC gave the regionals for the second week, so I was able to back out the regionals for the first week as well. Thus, I'm treating today's release as two separate polls for projection purposes. While there was little movement at the end of June, the Liberals have lost significant ground in the first week of July. The most drastic change is in Ontario, where the Liberals led by 3% at the end of June, but supposedly trailed by a whopping 11.3% in early July! The caution is that EKOS only polled 1166 respondents in the most recent week, so a bump like this could be mostly statistical noise. I have a concern about the most recent poll: you report 18.3% as the NDP national support for 6/22-29, 17.9% for 6/30-7/6, and yet somehow, their two week average, 17.5%, is lower than both. How is that possible? 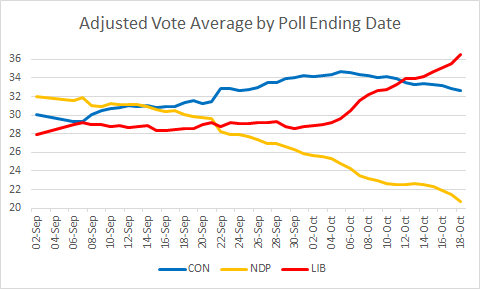 I think that you might have flipped the Liberal and NDP Atlantic numbers for the computation of the 2nd week national averages. According to the tables posted by the CBC, the NDP got 42% on 6/30-7/6. Given that it got 19.4% there in the two-week roll-up, that implies they only polled 8.7% in the first week of polling. Even with small Atlantic sample sizes, that is extremely unlikely. Furthermore, swapping the NDP 42% with the Liberal 24.8%, and recalculating the 6/30-7/6 national averages accordingly, would make all your numbers consistent. Such a mistake would mean that EKOS' reported national figures for the 2nd week are 1.3-1.4% too low for the Liberals and too high for the NDP. However, if I'm right about them swapping the NDP and Liberal numbers in Atlantic Canada for the 2nd week, the Liberals would take two seats from the Tories in the Atlantic. The Tory national lead is estimated at 7.4%; if I'm right about EKOS' mistake, it would be 7.1%. Note: As discussed previously, the lack of polls is forcing me to change the formula for the summer. I have lengthened the depreciation period for a poll from 27 to 34 days; I plan to leave it this way for the rest of the summer and switch back to 27 days in the fall, but of course things might change as the situation warrants. Furthermore, for this update alone, I made an ad hoc adjustment due to the fact that the most recent EKOS poll has a much smaller sample size than their previous polls. G7: Good Comparison Group for Canada? Canada likes to compare itself to other G7 countries on economic matters. Our fiscal situation is better than all 6 of our peers, and our material standard of living is better all but America's. For a decade, no Minister of Finance has seemingly ever missed an opportunity to remind us of this (especially the former). Given that we don't want US-style inequality, there really isn't much to improve, is there? Unfortunately, G7 comparisons may lead us to unwarranted complacency. Out of 28 OECD countries (there are 31 OECD countries total, but no data for Chile, Mexico and Turkey), Canada ranks a middle-of-the-road 12th for lowest net debt as a percentage of GDP, projected for 2011. All 6 other G7 countries are among the 10 worst offenders. Do we really want to compare ourselves to them? Most Scandinavian countries, as well as Korea, Australia and New Zealand, have little or negative net debt - the latter meaning that they actually set aside assets over and above their gross debt in anticipation of population aging. We're in a good fiscal position, but with looming increases in pension and health care costs, we're definitely not out of the woods. Of course, Canada is not quite as resource-rich relative to its population size as Australia or Norway, and there is no way our financial sector could be as large relative to our population as Hong Kong's, Singapore's, Luxembourg's or Switzerland's. We don't want the instability of the Irish model or the inequality of the American model. But the other two countries in front of us - the Netherlands and Austria - as well as Denmark and Sweden, which closely follow us, can probably provide some lessons: all 4 of them have much larger government sectors than Canada, and yet their economies are just as vibrant as ours. This suggests that Canada has room to become more egalitarian without sacrificing output, or to become richer without sacrificing social justice. Moreover, Korea and Taiwan, which are rapidly catching up (they are already at Western European standards), have small governments and relatively little inequality (though the latter is increasing there as well). How do they achieve that? Just chalking it up to culture might prevent us from learning valuable lessons. By all means, the Canadian economy is among the healthiest in the world at this moment, and we can all be proud of that. But although G7 comparisons may suggest that we're head and shoulders above everyone else, we need to remember that the world is more than just the G7, and a few other countries - mainly small Germanic and East Asian ones - have an economic and fiscal situation just as enviable as ours. Complacency is therefore to be avoided if we want to keep Canada among the top. Remember that the next time you come across an international comparison from the Department of Finance! More seriously, if polling remains this slow, I may use an alternative formula for depreciation. Right now, a poll loses all value if its midpoint date is 27 days or more earlier than the midpoint date of the most recent survey (less than 27 if the firm has multiple recent polls). We know that EKOS will publish every two weeks. If, in addition, Harris-Decima, Nanos, Angus Reid and Ipsos Reid publish every month, and their polls are well spaced out from each other, I won't have to change the formula. But if these four firms publish results less than monthly, or if their polls come in lumps, I may have to lengthen the 27-day poll life span in order to prevent EKOS from dominating projections. Whatever happens, I will revert to the current formula in the fall. When a campaign occurs, the 27-day period would most likely be reduced to just 10-13 days. Is it the Time for Austerity? 1. Yes: Keynesian economics is wrong, and there was never a need for fiscal stimulus. 2. Yes: The recovery is underway, so governments can now withdraw stimulus. 3. Yes: Governments can't afford to keep stimulating the economy, either because: a) investors will soon balk at lending them money; or b) when the recovery gets underway, interest rates will rise, and big debts will prove too large a burden. 4. Yes: Monetary policy can still do more to stimulate the economy, and should do the job now that the initial fiscal stimulus has prevented a depression. 5. No: With short term interest rates at 0%, monetary policy has hit its limit, so fiscal policy is needed. 6. No: For many countries like the U.S., Canada and Germany, governments can borrow very cheaply. Thus the benefits of austerity are little (investors won't balk at lending them any time soon), while the costs could be tremendous if fiscal restraint thwarts recovery. 7. No: The governments that can borrow cheaply now should take advantage of the situation and invest in the future (education, infrastructure, etc.). - If too much debt is accumulated, that can nip recovery in the bud: when the economy turns up, interest rates will rise, and the government will run into huge trouble. So even though interest rates are low now, fiscal stimulus still carries a large cost. - If intense stimulus lasts for too long, the structure of the economy may shift toward sectors that cater to the government; this would slow recovery, as structural change back to "normal" would be required. Stimulus through tax cuts rather than spending can mitigate this problem, but tax cuts fail if people simply save the money.